Welcome to my first ever Vlogmas! I filmed this video to introduce Vlogmas and explain my plans for this season. Instead of daily videos & posts, I’ll be doing ’12 Days of Christmas’, or (at least) 12 videos December 1 – 25. 12 Days of Christmas – Instead of posting daily videos, I’ll be posting 12 new videos from now until Christmas. This way, I won’t stress about ‘having’ to post daily, and you won’t be overwhelmed by a flood of Christmas content. Shorter video length – My goal is to keep videos in the 5 – 7 min range, to keep things short and sweet. When I asked on Instagram for ideas and suggestions for Vlogmas, the majority comment was for shorter videos. Daily, long vlogs gets overwhelming throughout December with everyone doing Vlogmas, so I totally hear ya! Giveaway – I’ll be hosting my own giveaway (with 2 winners) probably within the next week. Be sure to follow me on Instagram so you don’t miss the post! Subscribing to my YouTube channel will also count as an entry! 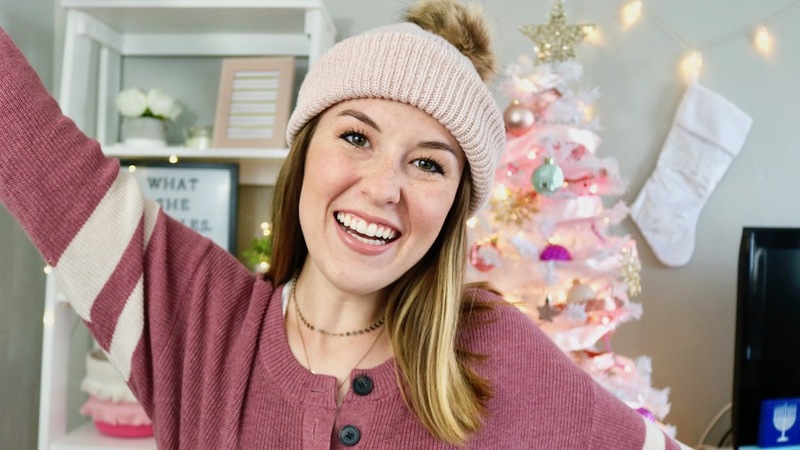 A holiday gift from me to you – My sweet sister had an idea for my Blogmas/Vlogmas that I absolutely loved. I’ve posted about why I love inspirational phone wallpapers so much. Every day of December (or every time I post a video, whichever I’m ambitious enough to do), I’ll be sharing a freebie custom lock screen I’ve designed for you. I think these will make such cute little presents for y’all, just for following along. I’ll be sharing the new wallpapers on my Instagram stories daily! Advent playlist – I just created a Spotify playlist for the 2018 Advent season! I’ve included some of my favorite Christian worship songs and a few Christmas songs. I’ll be adding to it throughout the season, but I hope it can help bring some light to your day and act as another reminder of the true reason behind this season. Blessings always! Happy December, and welcome to Vlogmas! I’m so excited for this month, & I hope you are, too! I love this idea, such a fun way to celebrate the holiday season! Can’t wait to watch Vlogmas!! This is such a great idea! I’m excited to watch!